The Global Solar Energy Standardisation Initiative or SESI was announced in June 2016 to spur worldwide solar development by standardizing contracts to streamline the finance, construction and operation of solar projects. 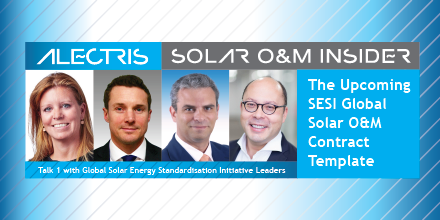 In this special multi-part series of the Solar O&M Insider, we are joined by leaders of this initiative and those involved with the O&M workstream. Members of the operations and maintenance workgroup are focused on the development of the Solar O&M contract template, to assist the industry in producing a streamlined innovative document with risk balanced for all executing parties. In this first episode, we are going to talk about the SESI initiative and standardization in general. Welcome to the show, all. Glenna: What is “The Global Solar Energy Standardization Initiative?” Jean-Pascal and Bruce, could you give us a brief introduction and explanation? Jean-Pascal: Yes. Maybe to give you a little bit of background on this initiative, it arose on the occasion of a discussion we had a couple of years ago now in IRENA headquarters in Abu Dhabi. This question about how to scale up the industry, or the solar industry in this case, at the scale which is necessary to achieve the sustainable development goals and the Paris agreement objectives. It was at the very beginning of January 2016, and what we realized, and I think it was something that we have witnessed as, I would say, common thinking in the industry generally is basically that we will never be able to achieve these goals if we continue to do things the way we do it currently. And the reason why that is basically how the way the industry works is mostly on a craftmanship manner where at each stage of the contractual chain, everyone is re-doing and reinventing the wheel completely each time. Maybe I’m a little exaggerating but we are not far from that. That generates a lot of cost of transaction, a lot of time of negotiation and makes it really complex. And moreover, it creates a lot of possibilities in the risk allocation because it’s left to the bargaining power of the parties each time. And you go to a process and at the end, you have the banker who says, “No, by the way, the way you allocate the risk during these two or three years of negotiations then end process, they are not acceptable for us and you have to re-do everything.” And that’s a pity because the costs are kind of high and they are applying also to smaller projects. So, that means it would be much more efficient, if you want to reach size, to have a standardized set of documentation which is allocating the risk on a fair manner and which have been drafted in coordination with all the stakeholders so that, at the end, you have very simplified set of contracts, which is fair and which helps the industry to go forward. Bruce: I can add on to that, Jean-Pascal–it’s Bruce Douglas from SolarPower Europe and Global Solar Council–that this mirrors what happens in other industries. If you look at the offshore vessel industry, for example, or the construction industry, they already have a set of standard template contracts they use to facilitate projects at lower transaction cost and simplify the whole process. So, this is not new in general in the industry, it’s just new to solar power. As Jean-Pascal says, it will dramatically increase the time of transaction, the simplicity of the projects, and will help lower the costs. Especially in emerging markets. Imagine in Africa and Southeast Asia, entering a new market each time with a new contract adds significant cost and complexity. This will help with that. Initially, the idea is to have an open source set of documents and also that they’re optional. As the industry takes these up, it’ll become more and more mandatory to use them. So that was the idea. Glenna: And if I’m correct, there’s seven core contracts, is that correct? Glenna: Within the SESI initiative. Jean-Pascal: Absolutely. The idea is really to have an integrated vision of the contract value chain. As I’ve said before, a solar project, a solar asset, is the result of a chain of contracts. And if you only work on one, you don’t solve the problem at all because you are reporting on the others, the burden of what you have done. So that requires to have a new integrated vision of the contractual value chain. And that’s the reason why we decided to standardize, to propose and to offer a complete suite of standardized contract, starting the way with the development phase. Then the supply, fit and commissioning DPA, OEM, SESI material agreement and the implementation of it. Glenna: That gives us a context for all of the contract templates that are within these initiatives. They’re called work groups or work streams. We’re drilling down in this series of episodes with the Solar O&M Insider on the operations and maintenance aspect of it. And so, we have two guests that are intimately involved with all of that: Sophie Dingenen and Vassilis Papaeconomou. If you two could tell us a little bit about the goal of the O&M group, and how does it differ or our work together with the existing SolarPower Europe O&M task force? Vassilis, maybe you could start. Vassilis: The nice thing about the O&M work stream in this initiative is that we inherited a lot of work done already in SolarPower Europe in the framework of Best Practices Guidelines Workforce. So, our contribution was more on the technical and operational perspective, where Bird & Bird actually has contributed from the legal perspective. On our end, as you probably already know, we have started in SolarPower Europe Initiative about one a half, two years ago, drafting these best practices documents. And once we actually got engaged in the work stream, the O&M work stream, the SESI work stream, most of the recommendations that we made were based on the best practices that were discussed prior to that. Of course, that was not the only input that we used. There was a lot of discussion. Also, with Jean-Pascal, we had a lot of interaction about this subject. We aligned these two documents together because the one additional considerations needed to be integrated in these standard documents and we aligned consequently also the best practice document that we have drafted in SolarPower Europe. And we’re going to be soon releasing the second version. So, our contribution, if I may say “our”, not talking on behalf of SolarPower Europe, of course, but as a leader of this task force, was to concentrate the knowledge and the experience that we have gained throughout the years as European players and consulting our members of the task force and putting all this knowledge to draft a standard document as required by the SESI Initiative. And that was the part of our contribution and, of course, this needed to be wrapped in the legal context, along with the guidelines given by SESI, and, of course, with the help with Bird & Bird and Sophie as well. Sophie: I think it’s what you mentioned, Vassilis, especially feeding on market parties’ years of experience and best practices that have been developed on both the technical side but also on the commercial side. And then as lawyers, you have to the nice stack who put it all into good documents. As Jean-Pascal mentioned, it’s a suite of documents which then need to be adjusted to fit together and need to be interlinked so that they also work as a project package in order to come to the point where you limit or reduce even the project development cost. Vassilis: But the purpose of all the initiative, but more specifically from the O&M workstream, is not simply to have a standard document. I mean, it’s not the ultimate goal just to have a nice document to look at. The purpose there–and I believe it’s a purpose of all these seven workstreams–is to have a standard document which is serving the needs of the market. And by that, I mean, what actually Jean-Pascal mentioned in the beginning of this episode, is to have a fair balance of risk and lower the costs. And if I may add, referring also to some discussions that we were having also with Jean-Pascal, is how to standardize the O&M in a way that opens up the market and makes the switch between O&M providers easier for the asset owners. Because one of the experiences that we have gained, especially in Europe in the last years, is that the contracts were written in such a way that the switch of an O&M contractor was made extremely difficult, just for contractual reasons alone. It was not really based on the actual quality provider or even the pricing. So there was a lot of change management required, which is a contractual thing. It has nothing to do with the actual performance and the interests of all parties. One of the things that we really struggled and I think we actually found a very nice solution, and I think we should be proud of that, is to have a standard document which actually makes such mobility, if I can use this word, easier so that the market, the O&M market, can evolve on a quality basis and not on complex legal structures, contractual commitments to change O&M’s contractors. That is something that is really valuable because it’s actually based on the experience that we’ve gained all these years. And I think we found a way to have a contractual arrangement to do that without increasing the risks of the parties. Jean-Pascal: What Vassilis just mentioned is absolutely right. And one of the key issues along with the Standardization Initiative in particular with the O&M, you talked about the mobility marginally. I think it’s about liquidity. We need to liquify the market and make it really simple to address for each of the stakeholders at each level, so that at the end, you can have standardized products that themselves fit into a liquid financial market. Because the end game is to be able to finance these assets at the lowest cost possible in order to have the lowest cost of solar electricity, so especially for developing and emerging countries who need that very, very much. And the liquidity of the system based on the standardization and the liquidity of each contract is essential. Glenna: Bruce brought up an interesting point earlier which was the fact that all established industries or most of them have standardized processes and documents and ways and standards that they are operating from. And the solar industry is now working on this globally, actually. So how does the SESI Initiative differ from some of those other global standardization efforts that are happening right now, Jean-Pascal? Jean-Pascal: Well, there’s two sides to the answer. The first is there are some initiatives of standardization of only part of the contractual chain and without an integrated vision of the contractual chain. And in this case, the very difference is obvious. It’s the fact that the SESI Initiative is really integrated. As Sophie mentioned earlier, we need to have, at each step, an understanding of each part of the chain and how it’s consistent and coherent in order to reduce all the leakages and all the problems arising from the developed chain. The second difference with other initiatives trying to standardize globally is the fact that what we are doing is not a proprietary initiative. We don’t develop standardization chain of contracts for the only usage of the members concerned but for everyone. And that’s why, as Bruce mentioned, we think it’s absolutely crucial that these contracts are open sourced. They should be given to the market so that the market can use them carefully. Bruce: I will just add to that as well, Jean-Pascal, onto the crucial fact that it’s open source and that it’s an integrated approach, two additional items. One is that these contracts are being put together by the leading legal firms operational in solar power development globally. For example, Sophie’s organization, Bird & Bird. But also, these contracts are going out to consultation to our members who are the leading solar developers in the world. For example, obviously, other solar power developers around the world for their feedback. It is really a very comprehensive process we’re going through in order to get the best legal and solar industry minds all coming to a consensus view on what should be or should not be included in these contracts. I think that’s the powerful element to it that’s being supported by industry and by the legal firms. Sophie: Thanks for the kind words, Bruce. But it is also important that all parties are aware of what’s at stake here and what is the appropriate balance of risk and that the risk lies with the appropriate party under the contract. And also, that not after passing a lot of time to negotiate all the relevant contracts that, for example, the financing banks stop the whole project at the end of the negotiation. It is also to create a certain time frame, whereby all parties are aware of steps that need to be taken and that certain issues that are critical in the past are being addressed in early stages. If the contracts work perfect, then they should not be addressed at a high level because then the contracts already take that into account. Glenna: How do you all feel about the industry’s sense of the need for standardization? Do you think the industry sees the need for these kinds of standardization efforts? And if not, why don’t they see it and how can we help them understand? Vassilis: Well, I think actually we have all sorts of reactions. If I can, you know, base daily experience that I have so far in various events, they’re either very positive reactions, like people have been waiting for that for a long time–and that’s very nice to see–but we also have, or I’m receiving at least, the exact opposite reactions, meaning like, “Why should we need that? No one is going to tell me how I’m going to do my job.” And this is something that I find really astonishing because standardization has, as also Bruce said in the beginning, is not something that we have invented. We are one of the industries that are a bit lagging in that aspect. Standardization is really standard for other industries and it’s not something uncommon. I do believe that the solar industry should have started these initiatives earlier but, you know, better late than never. I’m always surprised to see some parties that are reacting very cautiously and very reserved on that with the argument, “No one can prescribe how I’m going to do my O&M or what I expect from the O&M”. It’s not a huge percentage that are reacting like that but we still or I still see such reactions. I do feel there is some need of clarification what standardization is about and why it is good for in the industry as a first step. In the dissemination process or in the process of engaging more and more parties in the industry, we should probably explain the obvious what other industries have done. That standardization is not actually showing you how you do every single thing every day. It just gives you the guidance. It standardizes the framework, in which framework all the parties should operate. I don’t know if anyone has a better explanation in just a few sentences than this one but when I get the question, I always like to explain these using the example of the ISO 9000, for example, which is a global standard which is used by all sorts of companies. It doesn’t prescribe how you run your own company but it does describe the general requirements and rules of it, given a certain quality level. When someone uses this example from some well-known standards, people are starting to understand what standardization in the solar industry means. But we do or I do see the reactions where, you know, the positive ones, which is the huge percentage. But there are some cases, even for large firms I need to say, that they are very cautious as a first step before they actually get that explained. I don’t know what the experience of the other parties on the call here today is but, you know, from my perspective, I’ve seen both reactions so far. Jean-Pascal: On the general concept of standardization, I’ve almost only have positive feedbacks. It’s a need that most of the people in the market feel. And especially because they have a sense of urgency and also the sense of competition. Yes, some people, generally those who are living on the inefficiencies of the market like to have inefficient markets. But most of the others see that if you have standardized documentation, you tremendously reduce the cost of transactions over a deal. You can also contemplate up front what would will be the cost. That means you can be more aggressive bidders, when you are a developer in the bids. Offering a lower cost of electricity is precisely what the governments are waiting for and what is needed to accelerate the energy transition. And those players who will use the standardized documentation will have more chances to win. If someone wants to do differently and some people when the cars were invented were still thinking that they were better horse riders, that was the best way to travel. But at the end, in a few years, there were no more horses and carts in the streets of New York but only cars. Sophie: Given all the sustainable targets and all the sustainable goals that we’re all working to, the standardization of the contract package should stimulate the solar market and the development of solar project. It is, in a way, almost something that we owe to the world or to the environment to make sure that we develop solar projects at the lowest cost possible. The standardized contacts, given that these are based on years of experience and address a fair balance of risk, I would doubt that anyone can argue against that. Bruce: I fully agree with all the comments. When we’ve reached out to our members–and we represent more than 300 organizations globally active in the solar space–we receive nothing but positive feedback on it. Some are more active than others in terms of contributing to it and providing feedback but there’s no one who said they won’t use it once it’s out there. Glenna: Excellent. Well, let’s talk a little bit about the stage…Jean-Pascal, if you could address for us what stage the SESI program is in and what are the next steps? Jean-Pascal: This initiative has been officially launched in Munich in June 2016. And we set up the workstreams at this time and then the teams in each workstreams and the management team and the project management team in IRENA and Terrawatt Initiative have been working very hard, first of all, to define what were the assumptions, the contexts, and the baselines, basic lines of the allocation of risk that were needed to be done across the contractual value chain. That has taken more than a year because it’s probably the most important part of it. It was really about rethinking completely the way these contracts were done, it being reminded that most of these contracts are basically the copy, paste, and adapt from the project, lead project O&M guys in a particular industry and are not really adapted to what solar is. There was really a re-thinking of it, tried to get rid of everything that was unnecessary or was with the result of the historical fossil fuel implementation which everybody drafted but no one really understood why it was still there. That led to a workshop we had at the beginning of the summer this year to start the second phase, which is the drafting phase. In the meantime, we have added some workstreams which have linked to the applicable law or to the first national issues or the drafting principles. It takes time because it’s important to have a very consistent and very well drafted documentation so that it’s very clear and it has little room for generalization as possible. Because the purpose also of that is to avoid, as much as possible, litigation. We are planning to showcase the suite in the first instance at COP23 next month in Berlin, Germany. And to finalize, get some feedback from the stakeholders on the global side because we also will be able to talk about that to NGOs and governments, especially on the PPA side, which is one of the key issues where the interface with the government is really important. We will then bring that to the IRENA International Assembly in January, where we expect the governments to sign off on that as acceptable and recommendable suite for standardized contracts, which help the achievement of the goals. Glenna: Sophie, where are we at with the O&M contract template? Sophie: We have been working for a couple of months on drafting the term sheet. The term sheet has been agreed over the summer and is now being finalized into a draft agreement. That agreement is, at the moment, being standardized in terms of, as Jean-Pascal says, “Force majeure,” clauses which should be identical across the whole suite of contracts in order to make sure that the contracts do not conflict with each other. That is quite important. After that, we will work together with the other workstreams of the other standard agreements in order to achieve one solid standard package of different agreements, which will then be sent to market parties, such as banks, developers, contractors, and the members for consultation. Although we already have these parties gathered in the workstreams and they are providing input, it is also important to seek consensus with the actual market. That will probably lead to some quite minor changes. But then it goes to, as Jean-Pascal mentions, to COP23 and where it’s presented. And then in January, hopefully, signed off by the government. Glenna: It seems to me, when I think about the fact that we are in a year of the world’s worst natural disasters, and we have consensus across the globe that we need to address this, that the SESI contracts have the potential to take the friction out of the market to move massive amounts of money into investment for solar to actually resolve and address these issues. Am I seeing that correctly, Jean-Pascal? Jean-Pascal: Yes, you are. I really agree on the fact that there’s an incredible momentum. But I would like, at this point, to point out that standardization itself is a crucial part but only a part of a more comprehensive approach, which has been developed for three years now. It’s not only about the contracts and the contracts are very important that mostly are managing the private parties’ relation except for the VP and the international agreement. But also, it’s about the regulation. In order to accelerate the market, the governments themselves need to do exactly what the private parties have done with the contract. The contractual standardization is really to try to set common rules which will help facilitate the acceleration of the markets. There is also a de-risking side of it because, especially in the countries where you don’t have hard currencies, which are the low and middle-income countries, you still are facing some risks which that can’t be addressed neither by the regulation or by the contract, which are linked to the economic situation. That’s what we are also pushing this year. Together with standardization, together with harmonization of regulation, this can really change completely the organization of the market and the size of the market. If we are really serious about the Paris agreement objectives and just in solar PV, our calculation is that we will need to have installed capacity of 2.5 terawatts by 2025. That means that starting from now, we should be investing every day $750 million per day, which we are not able to do currently because of this situation of non-standardized contracts, un-normalized regulation, and a highly risky financial environment. We need to tackle all three at the same time, and it won’t work without the standardization. But the standardization itself will not do everything. It’s a global and holistic approach that we need to bring. By the end of this year, there will be, after COP23, two major events. There will be one is the summit, the International Solar Alliance in Delhi in 8th and 9th of December, and the Climate Summit in Paris on the 12th of December. The French leadership of these events and summits are also trying to push the agenda to help this process of harmonization, standardization, de-risking, to go together and make the difference. Thank you, listeners, for joining us for this special episode of the Solar O&M Insider, dedicated to the O&M standardization efforts by SolarPower Europe and the Global Solar Energy Standardization Initiative.